It would have been difficult not to feel a certain level of emotion when the public gave me a standing ovation at the screening of BRIDES OF DRACULA on sunday, march 13, as part of the cycle "Dans la nuit de la Hammer" (1). Thinking back about it, it was a novel experiment on more than one level. Being in Italy when the film was released in 1960, it was no directly informed, at the time, of the way the film was received in France. So, after all these years, for the first time, I was meeting the parisian audiences, a warm crowd of all ages. The other peculiarity was to see the film in a prestigious location : the Orsay museum. For fifteen days, a selection of Hammer film successes was to be screened. It was an institutional acknowledgement, begun in 2007 with the Terence Fisher retrospective at the French cinematheque (2). These exploitation films made for a large audience, which enlivened days ( and nights ) of the "grands boulevards" movie theaters, once dismissed as "horror films" in the movie guides, have become classics and are now studied by cinema historians. They've come such a long way ! 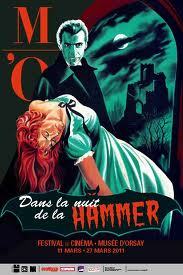 1- " In the night of Hammer" initiated by Guy Cogeval, art historian and president of Orsay and Orangeries museums. 2- Organized by Jean-François Rauger, whose brilliant analysis of BRIDES OF DRACULA can be found in the bonuses of the dvd produced by Bach films.